The final day of the 2013 Allstate All-Canadians National Mentorship Camp culminated with the event these kids have been training for all week - the Mentorship Cup game. Team Spezza (red) and Team Giroux (white) were pitted against each other in front of more than 3,000 screaming hockey fans at the Hershey Centre in Mississauga on Saturday, August 10th. While the players seemed a little jittery as they hit the ice, they quickly shook off their nerves of playing in front of a national TV audience for the first time. This year’s All-Canadians kicked the game off with a bang - literally. Michael Campoli of Team Spezza made his mark early with a big, clean open ice hit, setting a high level of speed and physicality for the game. Special guest referee Kerry Fraser complemented Campoli for not elevating during the hit. Team Giroux’s offence put Team Spezza’s goaltender, Samuel Harvey, to the test early into the first period as well. Within 8 minutes Harvey had made 8 big saves. Adam Mascherin would be the first All-Canadian to put a goal on the scoreboard for Team Giroux after burying the puck short side under the bar. His sliding celebration into the boards got every player on the ice fired up. Not to be outdone, Team Spezza’s Tyson Jost was fed the puck in front of the net and did a nice spinorama move with a quick release and put it past Harvey for the first time in the game, tying it up 1-1. Late in the first, Team Giroux had a chance to gain a lead - after taking advantage of the game’s modified rules - with penalty shot after Team Spezza received a tripping penalty. Samuel Girard took the shot but he was turned down by goaltender Evan Fitzpatrick. Coaches Claude Giroux and Jason Spezza, along with their Assistant Coaches Matt Read, Jeff Skinner, Brayden Schenn, and Michael Del Zotto calmed the nerves of their teams in the intermission. Whatever Coach Spezza said during the intermission, it worked. Tyson Jost got his second goal of the game less than a minute into the second period. Team Spezza’s Ryan Kubic made some solid saves as Team Giroux fought hard to come back, but ultimately Joseph Mizzi put one in after pulling the puck away from the boards and impressively dancing through Team Spezza’s defense. Hunter Moreau finished off a great play moments later to make it 3-2 for Team Giroux. Felix Lauzon tied the game 3-3 with an incredible unassisted goal, with 8 minutes left in the second period. The tie didn’t last long as Tyler Benson attacked the net with frightening ease to score Team Giroux’s fourth goal of the game, and the scoreboard read 5-3 by the end of the period. In true All-Canadians fashion, Spezza's players showed mental toughness and resilience as Sam Steel cut the lead by one moments into the third period. Team Spezza came back strong with two beauty goals, earning themselves a one goal lead. Though they fought hard to tie it up, Team Giroux came just shy of scoring again before the buzzer sounded at 6-5 for Team Spezza. The 2013 Mentorship Cup lived up to it's reputation and gave fans (in attendance and at home) a glimpse at what the future of Canadian hockey might look like a few years down the road. Skill, passion, mental toughness, and impeccable sportsmanship were on display today. 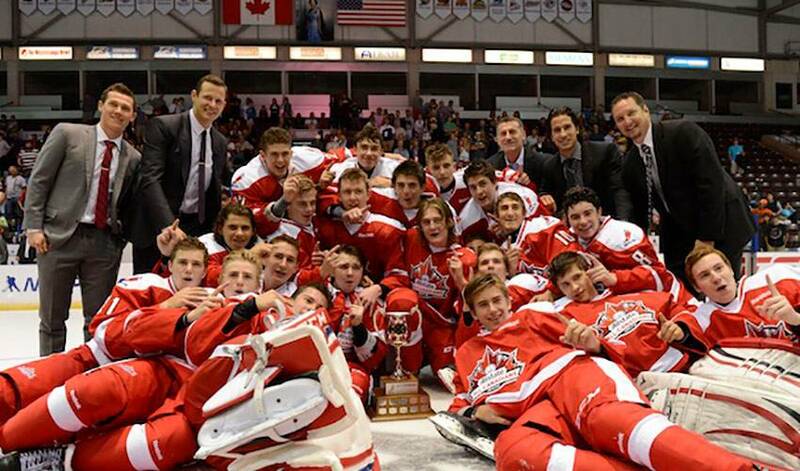 Red and white shone bright - making Canadian hockey fans proud. It was the perfect end to a week these young players won’t soon forget. Greatest experience of my life so far at the @All_Canadians camp. Thanks so much to the @NHLPA and all the staff who helped out.